Bicobee - a name randomly created by a computer - is a maze game with a simple goal: Reach the end of each level. The blue ball is the player and when it rolls, so does the camera. The direction in which you move is relative to the rotation of the ball, making it really easy to lose orientation. On top of that, most walls tend to end your life immediately. If you are too slow, you are done for. I can't tell for sure how long the ball takes to get all the way down, but it's adjustable per-level - it can have 1x, 2x, 0.5x and 0.25x the time. 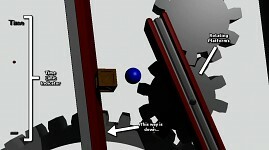 When the ball reaches the small block underneath it, it resets the level. Not depicted: Powerups that give you extra time. They come in two versions: Red and Grey. The red one, just like the walls, kills you instantly, while the grey ones just bounce you around (which, come to think of it, will most likely end with you hitting something red). The platforms are rotated by the cogwheels in the background, which looks badass in motion. What is not in the picture? The previously mentioned powerup, granting you some extra time to make it to the end of the level. This is not to be understood as a checkpoint, since dying will still send you to the beginning of the level. Turrets. They shoot red balls and if you hit a ball, you're done for. Other turrets - distinguishable by looks - shoot grey balls that have little mass and only bounce you around a little, disorienting you without neccessarily killing you unless you move hastily. Obviously, other levels. One planned feature are levels in which the player is an orange box (no pun intended, Valve people) that has less mass and stops spinning faster than the ball does. I originally wanted to swap between ball and box within the level, but that didn't work out too great. Some decoration. Nothing fancy, just to make the level look a little better. So... yeah. That is about it. Any questions? A maze, a ball and some vomit. Who wants to join? Hurlbags not included. pretty cool conecept, although it was a bit confusing at first... I didn't get you could fly around at first, but anyways looks promsing. -Some kind of indicator telling you where's the ground, what directiong the gravity goes. It is supposed to be confusing. The code for every single direction is the very same except, well, for the direction. So there is no "fly" key per se - but the indicator is a useful idea. I'm currently thinking about how it could be implemented. I'm still new to this engine. Interesting idea for a game - I like it. It could use some textures, though. Also, maybe you should limit how fast the ball can rotate (so that the camera doesn't just go out of control). "Out of control" is pretty much what I am aiming for actually. If you try to go to fast, you are likely to be thrown in to a violent spin which is nearly impossible to control - thus you can't just rush through the levels.